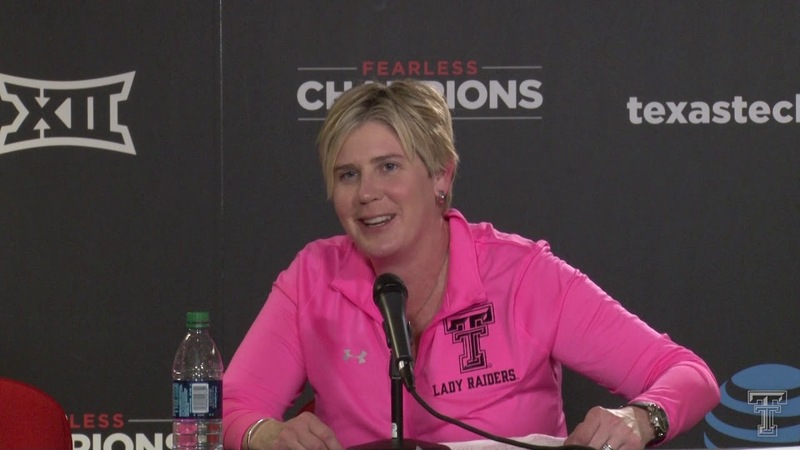 LUBBOCK, Texas – Behind five players in double figures and a record-setting fourth quarter, The Texas Tech Women’s Basketball team captured it’s 11th win of the season with a 90-78 victory over Oklahoma State during the Play4Kay Pink Game on Saturday. In front of a season-high crowd, the Lady Raiders snapped an eight-game losing streak and earned their second Big 12 win of the season. With a 2-10 record in Big 12 play, Texas Tech surpassed its win total from last season. The Lady Raiders started out strong in the first quarter, opening up with a 9-0 run and forcing an Oklahoma State timeout with 5:57 left in the period. The Cowgirls battled back and cut down the Lady Raiders lead to three heading into the half. It was another tight quarter in the third as both teams were hitting shots. With a two-point lead, the Lady Raiders headed into the fourth quarter. The Lady Raiders knew they had to finish strong and behind a record-breaking 31 points in the fourth quarter, Texas Tech sealed a 12-point win over the Cowgirls. Texas Tech shot 60 percent in the final period and held Oklahoma State to just 32 percent. The Lady Raiders also made 12 of their 14 FTs in the final frame. Texas Tech: Five Lady Raiders scored in double figures against Oklahoma State. Erin DeGrate led the team with 21 points. Angel Hayden followed with a career high 19 points. Chrislyn Carr scored 17 points followed by Sydney Goodson with 14 points and 10 rebounds. Brittany Brewer rounded out the five with 11 points of her own. Oklahoma State: The Cowgirls had three players in double figures. Vivian Gray led the Cowgirls with 22 points while Jaden Hobbs posted 17 points. Latashia Jones added 13 for the Cowgirls. The Lady Raiders move to 11-12 on the season, 2-10 in Big 12 play. This was the 64th meeting between the Lady Raiders and the Cowgirls. Tech moves to 43-30 all-time against Oklahoma State. This is the first win over Oklahoma State since Jan. 1, 2017, when the Lady Raiders defeated the Cowgirls in Lubbock, 70-65. The 90-point total by the Lady Raiders is the second-most points scored for Tech this season. The Lady Raiders outrebounded the Cowgirls, 52-37. Tech has outrebounded 18 of its 23 opponents this season. The Lady Raiders are 11-7 when outrebounding their opponents. With 52 rebounds tonight, Tech has recorded 50+ rebounds in seven games this season. The Lady Raiders are 5-2 when recording 50+ rebounds in a game. Texas Tech’s 31 points in the fourth quarter was the most in the fourth period in school history. Sophomore Angel Hayden had a career night as she posted 19 points, seven rebounds and a steal against the Cowgirls. She made a career high six FGs and six FTs in the contest. Her perfect 6-for-6 performance at the charity stripe in the third time she has been perfect from the line this season. Freshman Chrislyn Carr scored 17 points, marking her 21st double-digit point game of the season. She has scored 17+ points in 16 of the last 19 games. With a 6-for-6 night at the charity stripe, Carr has made 27 straight FTs dating back to Jan. 12 vs. Oklahoma State. She has made 34 of the last 36 FTs dating back to Jan. 9 vs. Kansas. Sophomore guard Sydney Goodson recorded 14 points and 10 rebounds for her second double-double of the season. The 14 points tonight marked her 13th double-digit point game of the season. The 10 rebounds tonight marked Goodson’s third double-digit rebound game of the season. The Lady Raiders conclude the three-game homestand on Wednesday as they host West Virginia. Tipoff is set for 6 p.m. on FOX Sports Southwest Plus.